What is the Alexander Technique…and Why Would I Need It? Pamela Nelson is the Instructor of Flute at Meredith College in Raleigh, NC, has a private studio, the Nelson Flute School, also in Raleigh, and is certified by Alexander Technique International (ATI) to teach the Alexander Technique. Question #1: What is the Alexander Technique? AT was created by F.M. Alexander (1869-1955), an actor in Australia and England, who kept experiencing laryngitis in mid-performance (Figure 1). That would be distressing! Imagine if you couldn’t get a breath or your hands locked up during performances! Alexander went to doctors who could find no physical reason for this, so they told him to rest his voice. This helped…temporarily. Deciding that the cause must be something that he was DOING in performance, Alexander began a regimen of careful observation of himself in mirrors while orating and, over a long period of time, discovered a pattern of subtle but excessive muscle tension which was affecting his vocal cords. Figure 1. F.M. 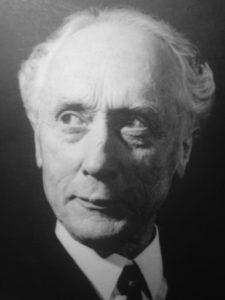 Alexander (1869-1955). These observations led to experimentation and then to the discovery that easing especially his excessive neck tension in a certain way reduced his spine compression and allowed it to lengthen, thus freeing his vocal cords. His breathing became much quieter, more efficient, and he stopped losing his voice! He was able to act again and, in fact, became much sought after as a voice and breathing teacher by actors, singers, preachers and anyone who used their voices professionally. Over time his clientele spread to include instrumentalists, dancers, athletes, equestriennes… basically anyone who wanted to move, speak or play more freely. The same is true today. There are thousands of trained, certified AT teachers world-wide carrying on his discoveries and helping people. Question #2: Why, as a flutist, would I need it??? Back in the 80’s when I had a brief exposure to AT, it went right over my head. It was, in fact, at a RAFA event at Meredith. I had arrived a little late because I was teaching upstairs, so I missed the whole introduction and setup. I remember not understanding what was going on and thinking to myself, “I don’t need this because I don’t really have any pain or particular problems while playing the flute”. Oh, how I wish that I had known then all that I know now! Remember all of that excess tension that Alexander discovered… and that he had not been aware of prior to that discovery? In our flute realm, that tension can manifest over time as difficulty with breathing and/or breath control, tone production, embouchure control, lack of finger freedom, really any one or more of these. In addition, learning to approach the flute (and life in general) with greater ease can help us manage headaches, avoid or ease back/shoulder pain, carpal tunnel, tendinitis, play with a more resonant, free sound and unbind our technique. What’s not to love about that? All of that said, studying AT is a commitment…a commitment to yourself. It is not a quick and easy fix, but it is a much more permanent fix when you learn how to include AT thinking in your day to day life, living without harmful habits that can bring about frustration and possibly injury over a lifetime. It is sooooo worth it, and I am living proof! But that is a story for another day. Learning Awareness and Inhibition, i.e. becoming aware of your habitual patterns of excess tension in your whole body, perhaps beginning with a “table lesson” (AT is most successfully taught with the help of the hands and suggestions of a certified teacher and, as such, requires light touch, but it can be accomplished more slowly without hands on if requested). Inhibition in this sense means learning to pause before beginning a habitual action or movement and learning to choose a better, more easeful way of performing the action or, indeed, choosing not to do it at all! Figure 2. 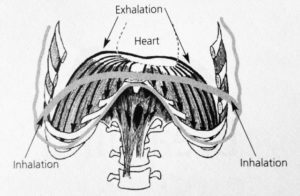 The diaphragm and its excursion. Constructive Rest, i.e. your “homework for life”! This is a floor “etude” to be done daily, ideally for 20 minutes (but 5 is better than none!). It is very helpful to do this first with the help of an AT teacher, but here is a diagram to give you the general idea. (Figure 3.) 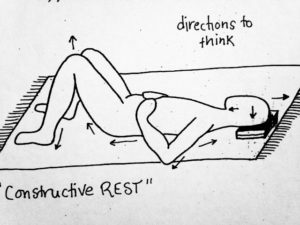 Lie quietly in this semi-supine position, a small, soft book or two under you head, on the floor on a carpet or yoga mat. Putting your hands on your abdomen allows you to notice your breathing while relaxing tension in the directions of the arrows throughout the body. Just be AWARE of how it feels to be in this relaxed yet aligned state. That is important. The Alexander Technique is so simple yet so profound and as complex as our minds try to make it. You, your flute playing and so much more can be set free if you so choose. Try it! Perhaps it will fascinate you or perhaps it will marinate in your mind until the time is right for you, as I did. But at some time in your life, with or without the flute, I hope that you will consider finding out more about the discoveries of a very remarkable man.